Sonya is French, but was raised primarily in the United States. 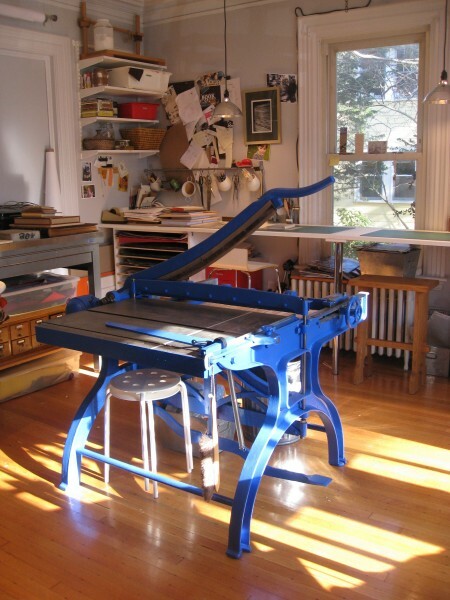 Sonya became a bookbinder almost by accident. While working in her college library, a friend in the preservation department gave her a little tour. Thus, she became vaguely aware of binding, preservation, and conservation. After finishing college in the United States, she and her now husband decided to spend 4 months in Brittany. Casting about for an activity where they would be speaking French only, they managed to enroll in an over-subscribed two-week-long bookbinding course with Anne Vion, a well-known binder and teacher. Sonya was smitten. When the course was over, Anne asked Sonya to continue her studies. Working intensely side-by-side with Anne for the rest of her stay in France allowed Sonya to complete the requirements for the French diploma for bookbinding. 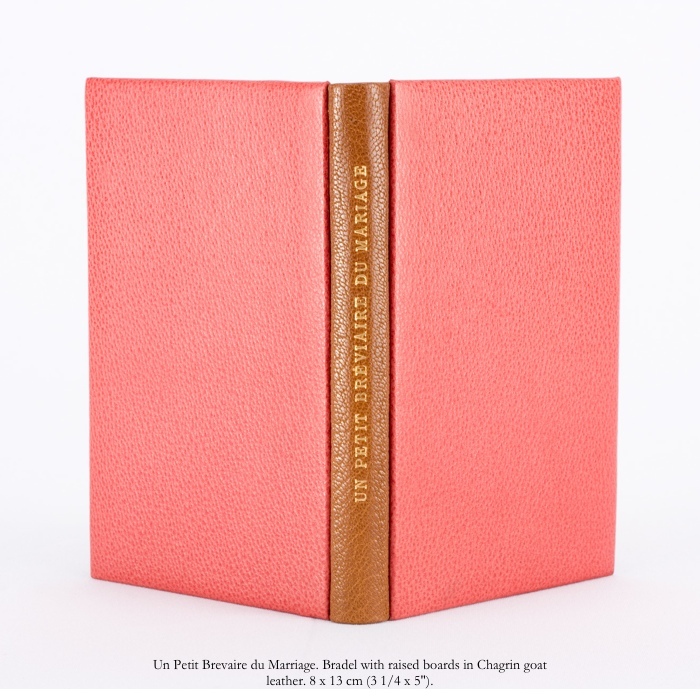 It is my understanding that, in France, one cannot practice as a professional bookbinder without this certificate. Sonya returned to France every summer to continue as Anne’s apprentice. During those ten years she was also teaching elementary school art (and, of course, binding on the side) A one-year sabbatical from teaching allowed Sonya to spend more time with Anne and study with master binders all over France and Belgium, learning new skills, honing her craft, and experimenting with unusual binding materials. For more details, Erin Fletcher did a wonderful series on Sonya in her blog A Flash of the Hand. Sonya is now a full-time binder. She teaches small classes (her bindery is tiny) and also teaches once a year at North Bennet Street School. 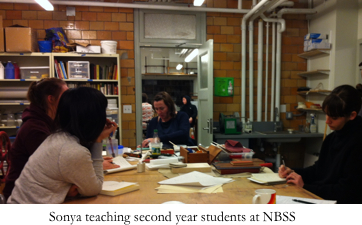 I recently spent an afternoon with Sonya in her bindery, and observed some of her teaching at NBSS. I don’t think I could possibly spend enough time talking with Sonya and looking at her work. 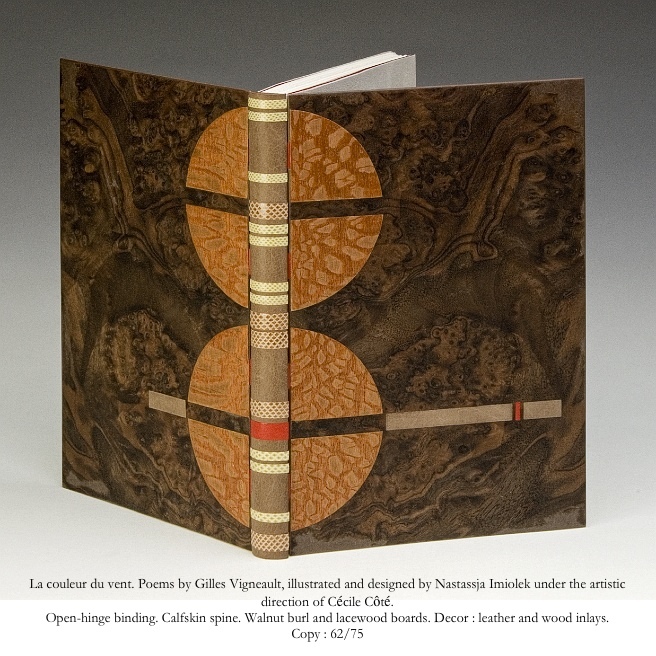 As far as I can tell, her training and work are so different from other bookbinders practicing in The Americas. As gorgeous as they are in photos, there are only hints of the true beauty and craftsmanship of her work. 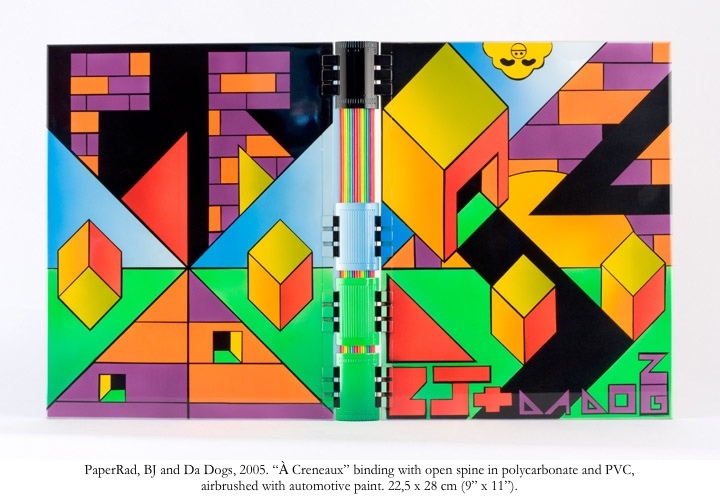 The subtlety of the materials and binding structures are apparent only in person. Sonya is not only an extremely talented and accomplished binder, but she is also really fun. We had a truly hilarious conversation translating binding terms she knows only in French and correlating bookbinder-to-bookseller vocabulary. There was a lot of pointing, laughing, and note taking. Fortunately, I can read a colophon in French and can usually make my way through a French booksellers’ bibliographic description. Unfortunately, I’m still struggling with certain binding vocabulary in English; forget about French! I learned how to say airbrush in French: aérographe. We still have to work on leathers. How do you say ostrich shin in French?